Greetings my friends. I have a question on mixing Tangs. Here is my dilemma. I have a 5" Gorgeous Purple Tang in my 250 gallon FOWLR tank. He and a 7" French Angelfish jockey for power. I tried to move a 4" Maroon Clownfish there, and the Purple Tang beat him senseless, so I pulled him. I am wanting to add an Australian Scotts Fairy Wrasse to this tank, but I fear the Purple Tang will make short work of him. I now have 8 other assorted Fairy Wrasses in the tank, who get along great with the Purple Tang. So, I was wondering if you think I could possibly move this Purple Tang into my 500 Gallon system, that already has 2 yellow Tangs, about His size, and a foot long Vlamingi Tang. If you don't think this will work, I will just have to pass on the Scotts Fairy Wrasse, and keep the Maroon Clown in my lightly stocked 75 gallon system. Thank you in advance for your advice. Well, here is how it went down, Mister Fenner. I had to take almost ALL the Live Rock out of my 250 gallon tank, to get the Purple Tang. I acclimated him, and put him in the opposite side of the 500 gallon system, from the two resident Yellow Tangs. He drifted over to their side of the tank, and initially one of them began the back to back tail slapping game. Then I rearranged a little Live Rock on that end, and the Purple Tang staked out his own territory. The two Yellow Tangs then began to take turns, challenging him for his turf. He fought them off each time, with just tail slapping, no cuts, or damage. Eventually he got wise, and moved to the large cave on the opposite side, where I initially released him. He now has his territory there, and the 2 Yellow Tangs respect this. As soon as I removed the Purple Tang from the 250 gallon tank, the French Angelfish and all the peaceful wrasses let out a collective sigh of relief:) Good call as always Mister Fenner. Thank you very much.! Thank you for your time to read and respond. I have a 72x24x24 FOWLR with 55 gallon sump, protein skimmer and ozone that had a bad case of Ich that killed half my fish. The remaining are in QT being dosed with Cupramine. I plan on leaving the DT fallow for 10 weeks. I am now planning my replacement fish. The current inhabitants are a blue jaw trigger, flame angel and bicolor angel. I would really like to finish the tank off with 3 tangs. I would like a Yellow Tang, Desjardinii Sailfin Tang (understanding their potential size with a plan to remove it to a friends 300 gallon when the time comes) and one of the following choices: Blue Hippo Tang, Powder Blue Tang or Purple Tang. As you can see I'm set on a fish with a blue/purple hue to it. I'm not too keen on the blue hippo because of its extreme susceptibility to parasites and I understand the Powder Blue is also more susceptible then others and from reading on your site they are not that easy to care for. <Yes, difficult.> That leaves the purple....and 3 Zebrasoma tangs. If I did this I would get all together, QT together and introduce together. I would shoot for a 3" purple and between 3" - 4" yellow and Sailfin. In your experience, what are the odds of this working out? If you were totally against it, what other larger fish could I get with a blue color to it? I am in the process of stocking a mature 75 gallons reef tank (about 90 pounds of live rocks and a couple of SPS and LPS corals, with room to grow), and after reading through pages of very useful information, I still have a few questions about fish compatibility. - a trio of stripped Cardinals (Apogon margaritophorus). - a Flame Angel or a Coral Beauty. - an Orchid or a Neon Dottyback (captive bred). The local Big Al's store has both Dottybacks, and from what I have seen, the tank housing the Pseudochromis aldabraensis is by far more peaceful than the one housing P. fridmani, even though the later has a reputation of being less aggressive (both tanks were standard 55 gallons, with about a dozen of individuals in each). Do you think that the P. aldabraensis will be too boisterous for the peaceful Cardinals? How about the compatibility of the Dottybacks with the Centropyge Angels? Is there a risk of either of them going hyper-dominant and harassing the other? If the fish population is reasonable, is the stocking order acceptable, or is it better to add the Angel and the Dottyback at the same time to give each and equal chance for establishing a territory? I recently had an unfortunate experience with a Brown Scopas Tang suddenly going in a killing frenzy, after 4 years of peaceful cohabitation with a Black-cap Gramma, and very well-behaved Coral Beauty and Flame Angel, so I'm trying to plane very carefully my next tank population to avoid this type of occurrence to happen, as much as humanly possible. and for maintaining this excellent website. Hi I have a 55 gallon and I've just had a Scopas tang for a week now and I ordered a Longnose butterfly with it at the same time but it was back ordered and shipped separately, when it finally arrived for some reason they sent me a Copperband butterfly. They told me to keep it and they would refund me the money because I told them I can't have 2 butterfly's in the tank and I also didn't want to have to ship the poor guy back. In researching I find that Copperband are difficult to keep so I will be doing everything I can to make this the best for him. We will be setting up a 175 gallon next year once our basement is finished so it would be for a year that these guys would have to co-exist in this tank. I added the Copperband today and the scopas has been very aggressive towards it. I kept the lights out for a few hours and after turning them on it's still the same. The Scopas doesn't bite him but he does chase him and back into him with his tail. I'm going to remove the Scopas and try to put him back in afterwards. Do you think if I re-arrange the rocks and then reintroduce the Scopas it will be ok? Or is there something else that you can recommend. I've been reading over your site like crazy trying to find the best solution but so far the consensus seems to be to re-arrange the rocks. Ideally I'd like to make it work out between them but if I can't I will most likely try to sell the Scopas or give it to the LFS. Any suggestions and ultimately do you think this aggression will go away or am I fighting a losing battle? I just wanted to say thank you for your advice. It encouraged me to make the right decision and the LFS let me trade the Scopas Tang in. The Copperband seems to be doing a lot better now. I just haven't seen him eat yet. I've been putting in fresh clams with the tops off and he keeps going up to them but then swimming away. Do you think it's just a matter of time before he tries them? I've been also trying frozen mysis shrimp, dried mysis shrimp, NLS pellet soaked in garlic and Marine flakes, I also tried a chopped up shrimp. I'm thinking of getting some blood worms tonight and putting them in the rocks. Are there any other things you can suggest. I've found most of these suggestions throughout your website and others but I'm always open to more. I have a Foxface Rabbit Fish and it is black yellow and white - well this weekend I went to our local pet shop and saw a Sailfin Tang - OH MY GOSH was he/she beautiful - I got so excited I bought him... not even thinking about him being the same color as the Foxface. Is this going to cause a problem? I thought I read somewhere that Tangs of the same color or fish of the same color should not be kept with tangs. They have been ok - I just don't want to come home to fish bones! Well - I have given up on the prospect of having a Tang in my tank :( we lost our Sailfin this weekend - everything was fine - eating good and I did a water change and he seemed to go down hill. What was really weird is the Foxface Rabbit Fish was VERY protective of her as she was ill. This morning when I found the dead Tang - the Foxface was in a fit - fins up and a dark color and would not let me get her out of the tank (hence his name Grouchy). Are Tangs a hard fish to have in a tank? Hi - yep - I'm full of questions this go round! I wrote to you about having the Sailfin Tang and the Foxface Rabbit Fish in the same community - everyone seems to be doing great - no problems - knock on wood.. I am wondering about the feeding of all the little darlings I don't feed too much because I don't want a lot of nitrates to build up. But when we walk by the tank - they all seem to be starving and coming to the feeding ring for food - I feed twice a day - flakes, pellet food and Seaweed because I have such a mix of fish - Damsels 5, Clowns 2, Tang 1, Angel 1, Foxface 1, Red banded Coral Shrimp - (yep I know that is a lot of fish for a 100 tank - but my nitrates are real low and everything else is good.) What do you suggest for feeding? My challenge is the purple tang has become very aggressive to the yellow tang. <Not surprising given your stocking list. This is just the last few days; both fish have been in this tank for 3+ years and have lived quite peaceful until now. There have been no additions to the tank for over a year. There is no apparent reason for the sudden aggression. Any suggestions, I am unable to remove one of them (can't get to them). 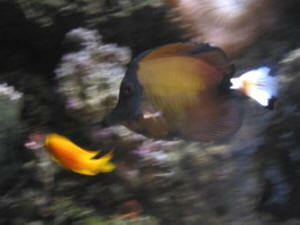 I have in my marine tank of 30g a Brown tang & a Percula clown (size:-1/2 inch ) long. 1) Tang is a bit aggressive towards the clown. Advice? < Remove the tang. Scopas Tangs are very territorial and should not be housed in less than 75 gallons. 2) Can I introduce a Clarkii clown( size:- about 11/2 inch )in the tank? Will it be compatible with the Percula clown? < No , Perculas grow territorial with age and tend to be aggressive towards other anemone fish. In a 30 gallon there is just not enough room. Sandi here. I have a situation that is 'not perfect' and would like your opinion. I have recently upgraded to a larger tank (120 gal w/ 30 gal sump) which means some fish have a new home, some fish relocated to the LFS, others are in quarantine. Currently in the DT, I have a 3-4" Blue Hippo Tang (largest fish), percula Clownfish, some gobies along with 2 fairy wrasse & 1 flasher wrasse which are new. In a hospital tank are 3 Resplendent Anthias (2F & 1M) which I will add to DT after the mandatory quarantine. In a different Q-tank I have angels: Flame and Singapore which I've had for quite some time and was planning to add to DT after the Anthias adjust. Lastly, in a 3rd Q-tank is a beautiful 3" purple tang, who's been waiting to be added to the tank (last) along with a yellow tang (same size), on hold at the LFS. I know this can be done, but not typically recommended. Knowing the Zebrasoma tangs are aggressive and need space, do you recommend that I try only 1 tang or skip adding either into the mix? Thank you for any suggestions. -Sailfin Stocking part 2- - 5/7/2006 Thanks! This one has been extremely mild-mannered in it's current home. The ones in my tank are also fine though at times the Kole picks on the Hepatus. That's changing as the latter grows, now they leave each other alone. <Good to hear, the sailfin will probably pick on them both to assert dominance as it is normally a much more aggressive alpha fish, so do be ready just incase. Good luck and write back to let us know how things are progressing if it does go well.> <Justin (Jager)> Thanks, I'll give it a go. Appreciate it! Killer Sailfin (& Cleaner Shrimp f') Hi Bob, how do I get my Sailfin Tang to stop attacking, my cleaner shrimp. Got the shrimp today at 12:00 pm, all of the antennas picked off by 5:00pm. <Put in more rock, hiding spaces for the shrimp and/or remove the Tang from its presence otherwise for a few days. The Sailfin is very likely only trying to "get the shrimps attention" for cleaning services... and the shrimp "suffering from jet-lag". It just needs a rest> Also, I noticed that they get wobbly after there antennas are gone, (fourth one he has killed). What purpose do the antennas serve, is it balance by any chance. <At the base of the antennae there are spatial orientation sensors... but not the antennae themselves... These will "regenerate" next molt BTW. Just save it from dying from exhaustion, being knocked about for now. Bob Fenner> Thanks for all the great resources.